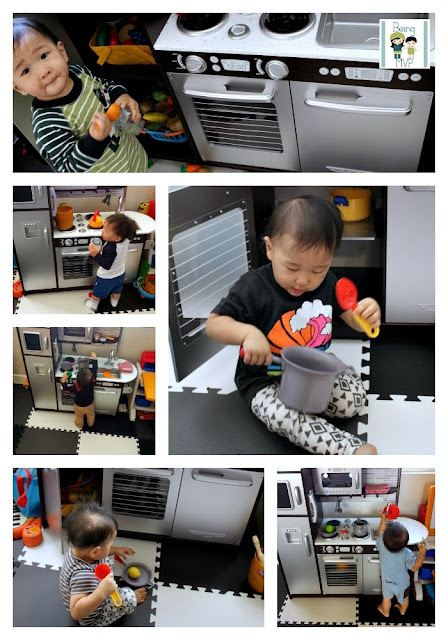 I never knew what a budding young chef Mason would turn out to be until the KidKraft Uptown Espresso Kitchen arrived for review. We have many KidKraft products that are being enjoyed by both kids so I knew I wouldn't be disappointed. I should note that if you are planning on getting this for a Christmas morning gift, make sure to plan accordingly as I started assembling this after work on Friday to surprise Kenzie when Hubs picked the kids up but I was still assembling until almost midnight (after dinner, play, bath and bedtime in between). The instructions are easy to follow but it's just time consuming. 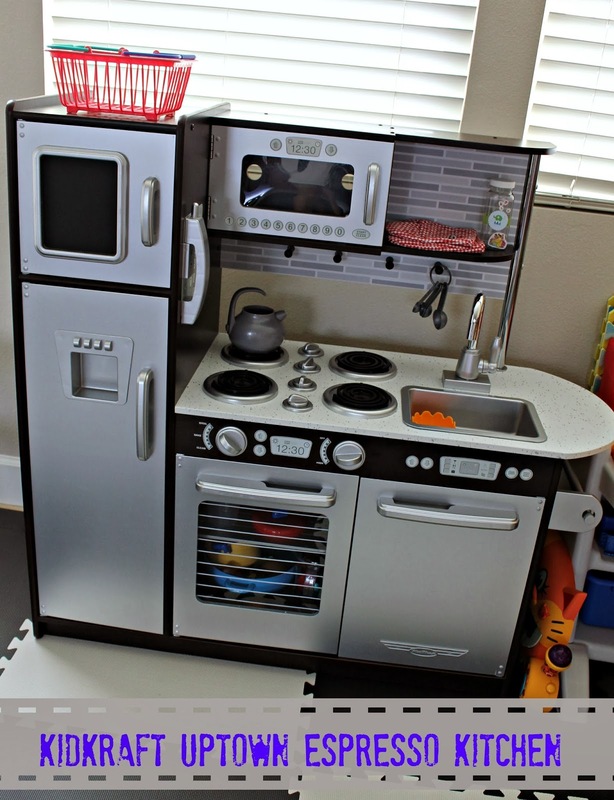 This is a huge upgrade from Kenzie's little Minnie Kitchen. 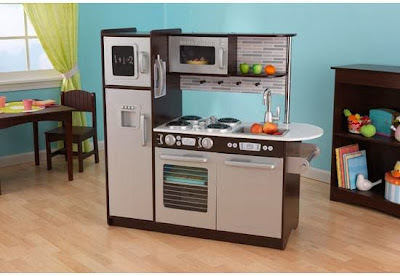 First and foremost, the Kidkraft Uptown Espresso Kitchen is realistic and has many bells and whistles. The modern look is refreshing in the play area and the generous size (42.52” L x 17.12” W x 40.98” H) allows for both Kenzie and Mason to play at the same time. However, they both like to push each other out of the way, at times, to have full reign over the kitchen. This wooden play kitchen even has a cordless phone which Mason likes to tote around and make calls. To whom I don't know but it is sweet just the same. There is also a paper towel holder on the side which is removable so I think I need to place a roll in there stat as Mason likes to tote around the holder like it's some sort of scepter. The doors all open and close on the refrigerator, microwave, oven and dishwasher. This is where the fun begins as the space inside is very accommodating to our mass of play food. Before the Kidkraft wooden play kitchen, there was food everywhere, including the laundry hamper and bathtub. Now that the food is somewhat contained neatly near the kitchen area, I am so relieved. The knobs to the range and oven fully turn and click. Mason commands me to turn the knobs for him as he is cooking on the stove top. Who knew that he would advance so quickly due to one toy? He enjoys stirring his foods and even filling his pots in the sink. At first, he would take the sink out and run around the house with it. After telling him to keep it in place, he efficiently turns the faucet handle to fill up the pot and start cooking. 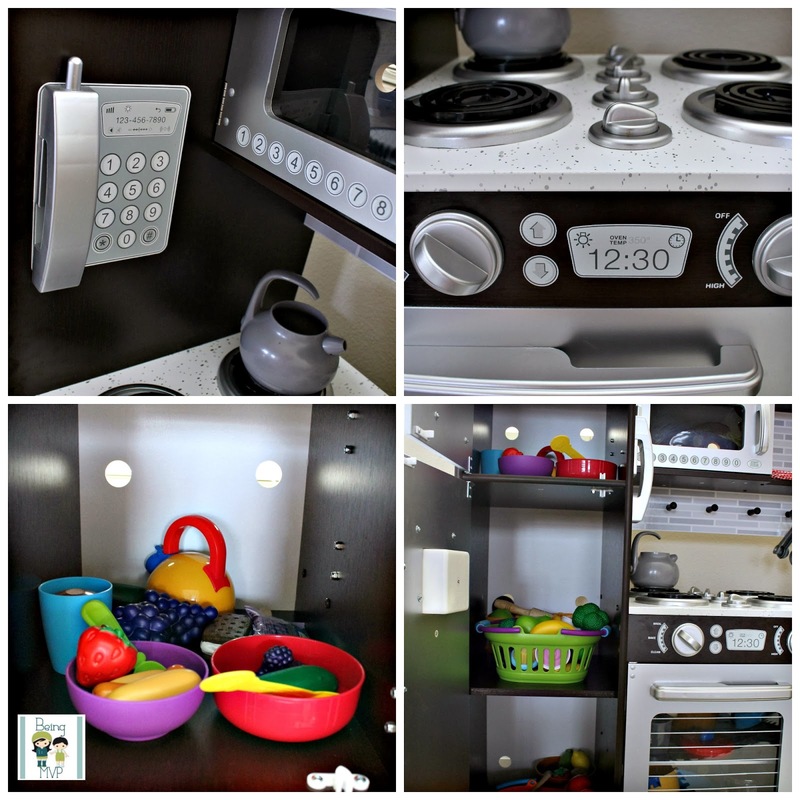 Mason entertains himself with this kitchen and I am a happy mama. Any child will shout in glee if they find this under the Christmas tree. Kidkraft has a variety of wooden play kitchens to fit any space and decor so head on over and find the perfect one for the holidays! Buy It: You can purchase the Kidkraft Uptown Espresso Kitchen for $143.99 with free shipping! My son needs this! It's so cute!! I love your sons leggings also! Holy cow that is a nice set! My daughter had a set and played with it all the time! That is an amazing kitchen and puts all over brands to shame! My grandsons would love to use their imagination in this kitchen! omg that is beautiful look at all the storage space it has too! LOL its better than our own kitchen the girls would love it! any recommendations for play food?